If you were looking for decent mid-tier headphones with Active Noise Cancelling, then look no further than the Saxhorn ANC J2. This headset is by no means on the cutting edge of the industry, but it’s a great entry-level product meant that won’t break the bank. 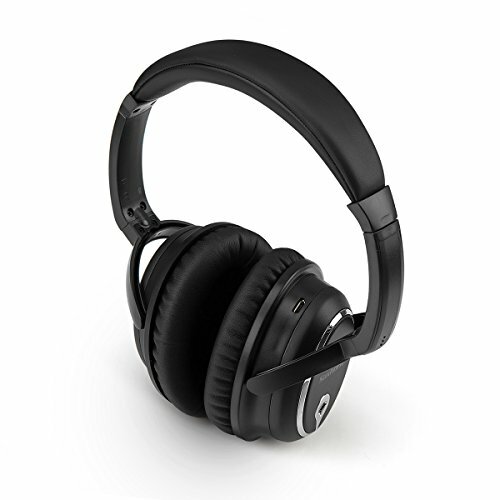 This is a closed back type of headphones, meaning that they offer full isolation from any outside influences. On the paper, the headset isolates more than 95% of the noise, and it sounds about right, even with the ANC feature off. The frame is mostly made of ultra-lightweight plastic, making it very travel-friendly. It also has metal straps with a stepped setting, which you can use to adjust them to your head size. Overall, this is not an extremely durable headset, and it probably wouldn’t stand for much punishment. Still, the manufacturer found a way to mitigate this by throwing a nice and durable protective case, making it even better for travel. On top of all that, the frame, or rather, the headphones in full are foldable, and packed, they barely take up any space. This is a wired headset with in-line sound control, so you can control the volume and accept phone calls simply by pressing a button on your controller. The headphones require no charging, so all you have to do is plug them in whatever device you need. There’s a standard 3.5mm cable, as well as an in-flight adapter, so you can use them during flight. One of the best things about this headset is the Active Noise Control, or Noise Cancelling feature, which does an admirable job. As you might’ve guessed, the headphones do a fairly good job of isolating you from background noises on their own, due to their closed back design, but once you activate the noise reduction module (the switch is situated on the right ear cup), you can really hear the difference. The Noise Cancelling module is a powered feature, meaning you need juice if you mean to run it. Luckily, the J2 has its own internal power system, with batteries that last, on average, 30 to 35 hours. The headphones themselves require no batteries nor charging, seeing as they are wired. The noise reduction switch is on the right ear cup, with a blue indicator light to tell you when it’s on, which is different from its predecessor, the J1, that had the switch on an inline module. 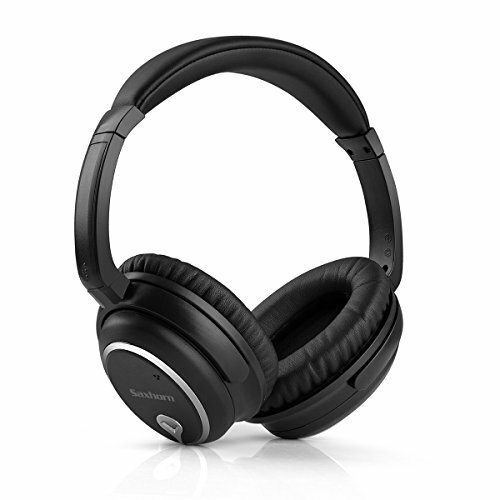 The headphones are quite comfortable, to be honest, with generous padding, and forgiving adjustable straps. The earpieces fit around the ears, fully enveloping your earlobes, passively blocking out a decent amount of noise from the background. We already mentioned that you can take phone calls using these puppies, meaning the headset comes with a mic. Speaking of which, there’s an auxiliary plug for it, but the microphone itself is not quite on a par, as it sticks out. It may be good for Skype and general usage in quiet areas like your house, but out in public, or outside, this is probably not the best thing to use for phone calls. Share the review with your friends, help us create more quality product reviews and buying guides. Saxhorn ANC J2 have a decent amount of what we might call “passive” noise reduction, or isolation, just thanks due to their closed back design. They do a pretty good job just blocking out any external sound. However, you can really feel the difference once the noise reduction module kicks in, cancelling low, rumbling noises from the background. They work really well drowning out the engine rumbling if you’re on a bus or the AC in your room. The sound quality overall is quite good. There’s lots of clarity, and you get a decent fullness of sound, with good lows, and pretty clean mids and high ranges. There’s not much boom to the bass, but it’s still OK. If you love pop music, and you really want that loud booming bass experience, this headset may not be the right thing for you, but as far as overall quality is concerned, this puppy is great value (what you get for $ you pay). To be honest, what you get is exactly what you pay. These are very good entry level headphones with active noise cancelling, but they’re nowhere near top-quality products. Still, for the price they’re going by, they’re a good bang for the buck. Sure, you could go cheaper, but there’s a limit even on saving money; besides, this is probably the best you can get in this price range. Thus, in a nutshell, Saxhorn ANC J2 is a great headset for the listed price. Needless to say, it also doesn’t really compare to high-end products, but that’s fine. 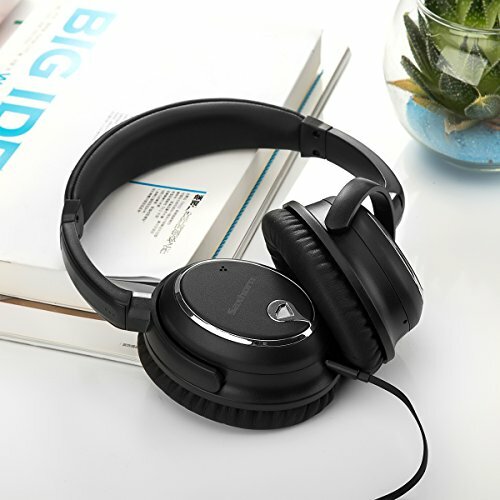 If you have the money to spend, and you want to go beyond entry-level when it comes to active noise cancelling headphones, you might want to spring for something else. Keep in mind, though, that this might end up costing as much as twice the money you’d pay for the Saxhorn ANC J2. The headphone provide a decent sound quality. In all category of sound quality, this provides good result except the bass could be a bit better. Based on the price of this item, there are fewer options to complain about the sound quality and comfort from this over-ear headphone. However, there's more option to improve the build quality as it's not a very durable item with its plastic frames. Spelling mistake in their manual is quite not acceptable. Well, if as a customer I want all the drawbacks to go-away, the price will go higher. I am still getting a good acceptable sound with a lower price and that's what I need from a headphone.